I’ve been actively following Sicad II, tweeting and writing about it (here are two articles: a primer and its implications). So when SICAD II turned one month old, it was time for me to play. Since I had to hand in some Cadivi folders, my father said “Anabella, aprovecha y métete en Sicad II”. More or less: kill two birds with one stone and make a bid on Sicad II. He was going to do it anyway, so I accepted the challenge – worse case scenario, if I didn’t get dollars, at least I hoped I could get a post about it. If there was going to be any value added, I figured I could spell out the steps to getting dollars via this mechanism. Though my brownies are a killer, I’m not much of a cook, yet the recipe seemed simple enough. Special bank account in foreign currency. Bolívares. As many or as few as you please, or have at your disposal. Wait a little, until you get an email that lets you know if you’ve been awarded. Wait some more. Not sure for how long, but you’ll have to wait to actually get the dollars. So I preheated the oven and went for it. I had to register before the BCV as a Sicad user in the infamous Rusicad data base. I registered in September 2013 with the hope to participate in Sicad I, but my timing was always off, as my traveling schedule didn’t match the calls. However, this registry is key – well, the famous mail they send you when you register is key. Even though it includes your passwords and answers to your security question, and it says “este mensaje contiene información de carácter reservado y está dirigido a las personas nombradas en este correo electrónica” (more or less, “for your eyes only”), we are required to hand in a copy of this mail to a bureaucrat in order to prove we’re registered in Rusicad. I had to open a special bank account in foreign currency. I must say that it was faster than processing Cadivi folders. I showed my debit card, my personal ID, a copy of it, and THREE minutes later … I had a new bank account in dollars. No joke, it took three minutes or less. I had to have enough bolívares available in my account. This is what took the most time: working time. After being done with the preliminaries, it came time to do some bidding. Bids for Sicad II can be placed between 8:30am and 11:30am on any business day. To do this, I had to hand in a copy of the famous Rusicad mail (see above), my personal ID and a copy of it (this is Venezuela), and my fiscal registry –known as RIF- and a copy of it (again, it’s Venezuela). When you’re bidding you have to specify the amount of dollars you wish to purchase, the rate at which you wish to purchase them, the source of the bolívares you will use to pay, and what you’ll use the Dollars for. You might be assigned dollars or bonds. In the latter case, you can choose to keep them or you can allow the bank to sell them as soon as you receive them. I bid on April 24 at 9:27am and left the bank four minutes later. Up to here piece of cake. If you’re thinking of doing this, one key question is how many dollars to ask for, and at what rate. You should always have a bank teller has a friend. They have the best tips (and love to gossip). A bank teller told my father that people asking for more than 3,000 dollars were not being awarded. I’m not sure if that’s completely true, but I took it as a ceiling, a rather high one when I did the math. Sicad II closed at 49.5568 BsF/US$ on April 23, which meant that 3.000 dollars came up to BsF 148,670.4. That is over 45 minimum wages. As far as the rate goes, it has stayed below 50 BsF/US$ since March 31, but it has been climbing since April 11. So I went with 50.5 BsF/US$. I was told that I would receive an email the day after the bid in case I was awarded the dollars or the bonds. Twenty-four hours didn’t seem like a long time, but I was actually puzzled: would I be awarded? Would I get the dollars or the bonds? On April 24 at around 5:30pm I learned that Sicad II had closed at 49.6759 BsF/US$, only 0.8249 under the rate I bid. I was feeling confident. Now comes the not so fun part: waiting for the money. The email also said: “tanto el valor efectivo en bolívares de su operación, como los montos correspondientes a comisiones e impuestos, se encuentra bloqueados en su Cuenta AHORRO – **** ZZZZ y le serán debitadas en la fecha valor de la operación”. This meant that my bolívares had been blocked. But when would I see those dollars reflected in my bank account? 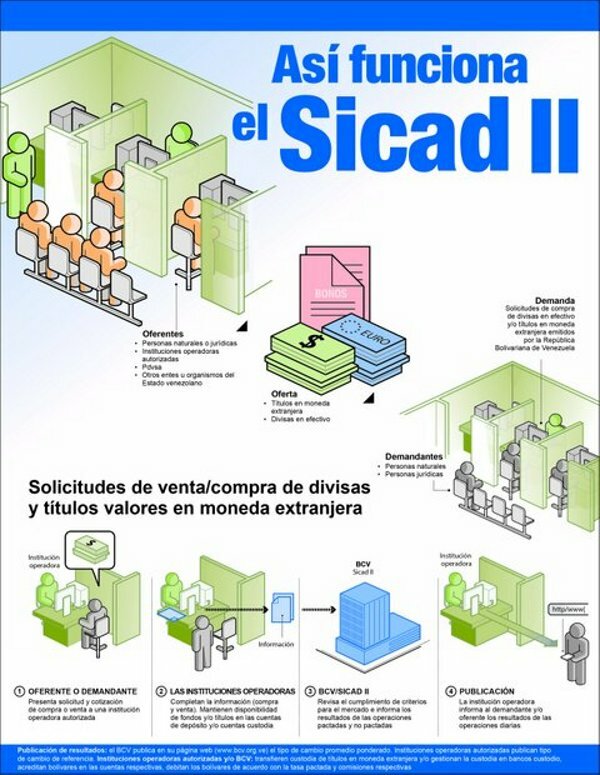 According to El Nacional, people complain about the delays in the actual deposits of the dollars assigned through Sicad II. Even though the Exchange Agreement No. 27 provides that, once the transaction is approved, the cash must be deposited within 48 hours and bonds within 72 hours, there are delays of up to on month. This would mean that I could be getting the dollars after my trip. Not so awesome, right? Now I know what foreign airlines operating in Venezuela feel like. I’ll let you know what happens. In the meantime, the government has blocked my local currency, and I have nothing to show for it. But I guess I won … right? GOOD NEWS… the dollars are in. EVEN BETTER… they are in my foreign bank account. The bolívares were debited from my account on April 28, under 48 business hours since I received the “you got awarded” email. However, the dollars weren’t reflected in my foreign bank account that day. According to a bank teller it could take up to 10 days for the dollars to be transferred abroad. On the morning of Friday May 2 I was drafting the “still waiting” update but decided to give it a few more hours – at least till the end of the last business day of the week. And thank God I did. It gave me a better ending to the story. “And so… on May 2, 2014, a week after been awarded cash via Sicad II, Anabella had access to the money. Now she could say she had conquered the beast. The End”.